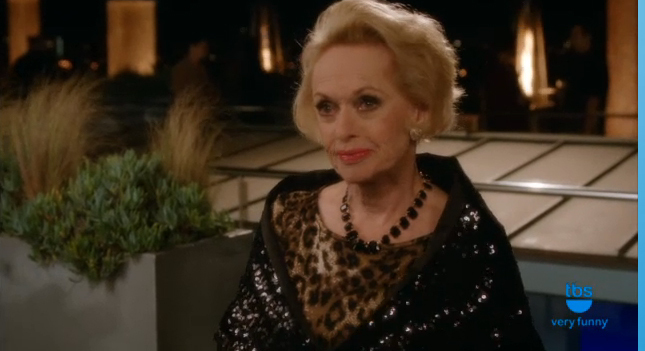 Tippi Hedren, star of “The Birds” and “Marnie,” and the subject of last fall’s HBO film “The Girl,” made a guest appearance on the season finale of “Cougar Town” last Tuesday, April 9. 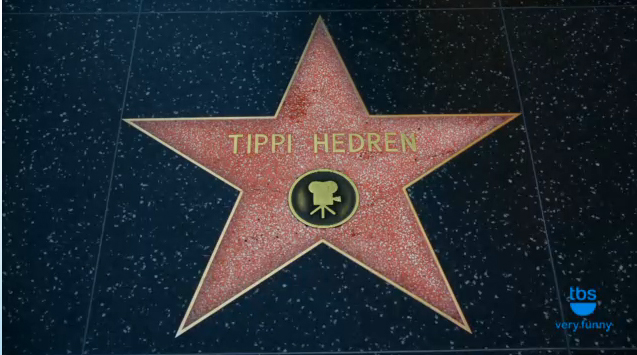 I happen to like “Cougar Town” quite a lot, so I was pleased to see Tippi appear in this touching episode. In the previous episode (which aired the same night) we learned that the father of series star Jules Cobb (played by Courteney Cox) is in the early stages of Alzheimer’s disease. In this episode, Jules and her Cul de Sac Crew decide to reroute their planned Bahamas vacation to head to Hollywood so they can help her dad, Chick (Ken Jenkins), have his dream of meeting Tippi Hedren come true. Along the way, much silliness ensues. Jules, who seems to be getting dopier by the minute (maybe she should lay off the vino?) thinks the stars on the Hollywood Walk of Fame are gravemakers; Laurie (Busy Philipps) tries to divert a security guard’s attention at Hedren’s house by kidnapping her cat, Tabby Hedren; Travis and Tom hire a one-man band to serenade Chick and Tippi. 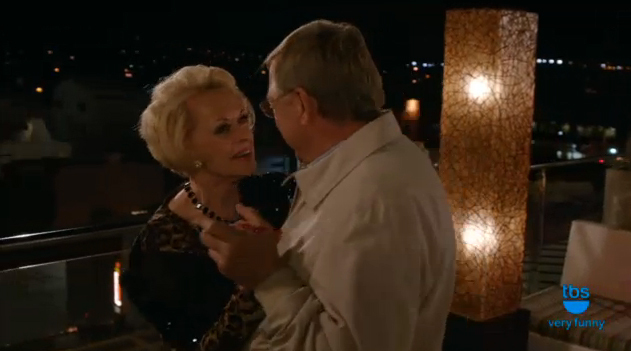 We don’t get to see Jules try to talk Hedren into her scheme, but apparently it works, as Hedren shows up to meet Chick and dance with him like they were old friends. If you want to see what Tippi Hedren looks like these days—and yes, she’s just as good and actor as she ever was—or just catch a sweet episode of a series I really like, you can watch this episode, called “Have Love, Will Travel” on the TBS website here.